Finland holiday cottage. Surrounded by trees and sitting next to the lake, Rock and Lake - Villas & Cottages offers accommodation with a private beach, jetty and yard. A Finnish wood-heated sauna is also included in each unit. A fully equipped kitchen, flat-screen TV and dining table are featured in each holiday home. The private, tiled bathroom has a shower and hairdryer. Free WiFi is available. Rock and Lake's facilities include barbecue facilities and rowing boats. Guests can also rent a hot tub, large fishing boat and canoes. Guided fishing and canoeing trips can be arranged. Kangasniemi is 23 km away, where grocery stores and other services are found. 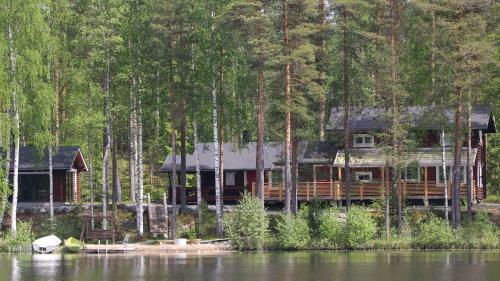 Jyväskylä Airport is located 100 km away from Rock and Lake - Villas & Cottages.